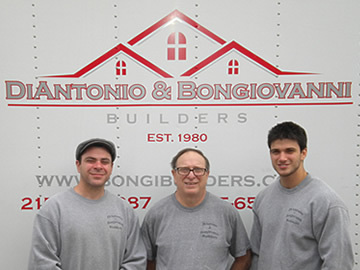 DiAntonio & Bongiovanni Builders is a general construction company that is family-owned and operated for three generations of custom carpenters (Bobby DiAntonio, Bobby Bongiovanni, Robert Bongiovanni Jr., and Marc Bongiovanni). Together, over the years we have run a successful business in Philadelphia and surrounding suburban areas. Ninety-nine percent of our business comes from word of mouth, repeat customers, professional architects and designers. We build long-term relationships with our customers. Both DiAntonio & Bongiovanni Builders and our subcontractors are extremely conscious of our work, and perform it in a neat and orderly fashion. We have worked together with our subcontractors for many years, so we all know each others next step which makes a project run as efficently as possible. Our goals are to allow you to continue your daily routine while your home is under construction and to leave you as a happy repeat customer who will recommend our services to your family, friends, and neighbors.